Do I Need An Extra Beauty Step? 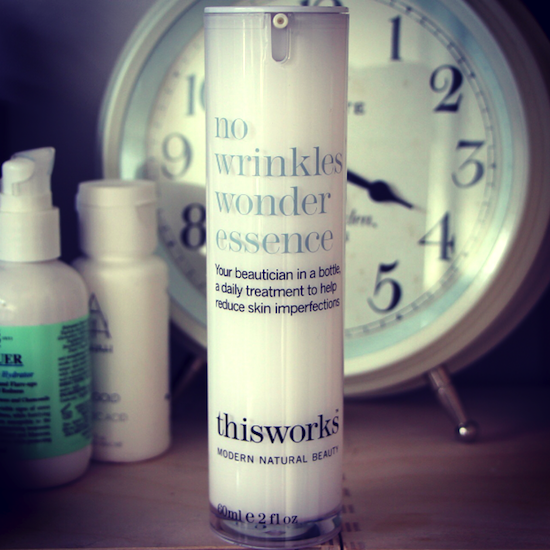 This is the No Wrinkles Wonder Essence from beauty brand This Works and it’s intended to be a new step in your beauty routine. Don’t hurl balled-up socks at the screen, I’m just the messenger! This essence is a “post-toner, pre-serum” step and it’s pitched as a “beautician in a bottle” – it aims to reduce skin imperfections by (I think) being mildly exfoliating and also to hydrate the skin with hyaluronic acid. It’s water-based, so incredibly light and fresh on the skin and it absorbs very quickly so that the skin is ready for serum or moisturiser. All sounds good (and I do very much like the texture of this product – you smooch a few drops between your palms and then press onto your skin) but I want to ask YOU: do we need an extra beauty step? If my toner is designed to rebalance my skin and perhaps mildly exfoliate too, then where’s the gap that the Wonder Essence can sidle into? If my serum is already pumped full of hyaluronic acid then do I really need a pre-serum liquid that contains it too? I’ll tell you why I like this essence: most of the time I don’t use a toner and often I don’t bother with a serum. I get my (proper) exfoliation from the AHA products I use overnight (see Liquid Gold) and I often skip serum because I’m using a “moisturiser” treatment that is very potent in active ingredients. I don’t like to complicate things. In those instances, I feel that the No Wrinkles Wonder Essence ticks a couple of nice boxes: a bit of quick moisture-fixing without adding any excess oils and a light little sloughing away of dead skin cells thanks to the enzyme exfoliation. Once it’s pressed into the skin, it’s as though the step never even happened – there’s no residue or tightness or added complication. Just a bit of mild skin encouragement and then onwards to the moisturiser. What do you think? Would you add another step to your beauty routine? Do you feel as though you have everything covered with your cleanse-tone-moisturise? Or cleanse-tone-serum-moisturise? Or, even, pre-cleanse-cleanse-tone-serum-moisturise-sunblock-primer?! What’s your beauty ritual? I definitely like the idea of a luxurious and long-winded beauty routine, complete with wind-chimes and Zen water features, but it would be quite a commitment!